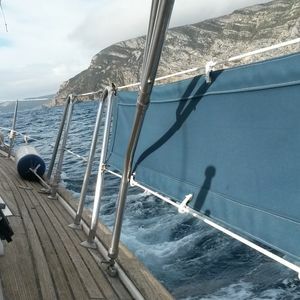 Check in 2 p.m. / Check out 11 a.m.
Stay on a boat in Sesimbra, Portugal. The Beneteau 473 combines extraordinary interior comfort, volume and light with bluewater strength. You will find that the 473 boasts more features and creature comforts than ever before built in a boat this size. She accommodates 6 within 3 cabins, and provides 2 bathrooms. There is suite cabin whith privat bathroom and shower and two cabin found aft with a shared bathroom. The saloon in this Beneteau Oceanis 473 features a large U-shaped sofa, with a second two-seater bench in the centre, and a table in-between creating a self-contained dining and lounge area. The galley on this Oceanis 473 is well equipped with oven/hob, sink, fridge, freezer and microwave, as well as plenty of storage. About the marina/waterway The Clube Naval de Sesimbra is equidistant between two of the main cities of Portugal, 32 km south of Lisbon (the country's capital and International port) and 32 km west of Setubal (International port). As well as fine sands, turquoise waters and a Moorish castle slung high above the centre, this former fishing village offers excellent seafood in its waterfront restaurants. Though the beach gets packed in summer, the town has kept its low-key charm with narrow lanes lined with terracotta-roofed houses, outdoor cafes and a palm-fringed promenade for lazy ambles. Cruises, guided hikes and scuba-diving activities here include trips to Cabo Espichel, where dinosaurs once roamed. It’s 30km southwest of Setúbal, sheltering under the Serra da Arrábida at the western edge of the beautiful Parque Natural da Arrábida.